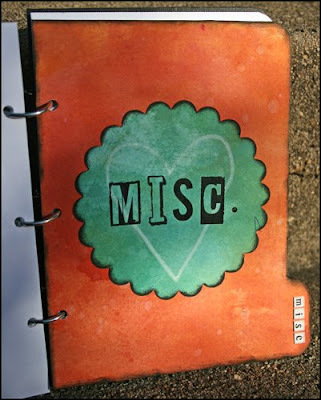 My Creative Existence: My Junky, Spunky, Joyful Journal. (Please excuse the dodgy pics - they were taken in a rush just before I posted it off - in July last year!). 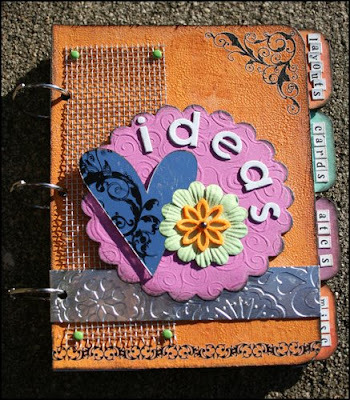 My ideas journal is published in Scrapbook Creations, Issue 61 on page 142. (yep - they spelled my last name wrong!). They can only show 1 small photo in the mag, so I thought I'd show you some close ups of the texture on the cover, and what the dividers look like inside. 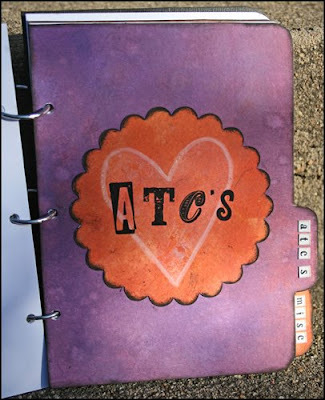 I created the whole journal from scratch, using Grungeboard for the front and back covers, chipboard for the dividers, and copy paper for the inside pages. I painted the Grungeboard cover pieces with Spiced Marmalade Distress Crackle Paint, and used some Fired Brick distress ink to highlight the cracks. I inked around the edges using Walnut Stain Distress Ink. I used Kaisercraft rub-ons in the top right hand corner, and across the bottom, and Making Memories metal mesh down the left hand side, which I attached with brads. The metallic strip along the bottom was made by gluing alfoil to chipboard, and running it through my cuttlebug using an embossing folder. The scalloped circle in the middle is swirly grungeboard that I die cut using a nestabilities die, and painted with acrylic paint. The heart on the cover is a Heidi Swapp mirrored heart, and next to it I have attached some paper and felt flowers, with a Kasiercraft pearl for the centre. Chipboard letters were used to spell out "ideas". I covered the chipboard pieces with white paper that I had inked with TH Distress Inks using the "Wrinkle Free Distress" and "Spritz and Flick" techniques. Each divider is a different colour, with another colour used for the scalloped circle in the centre which holds the title. 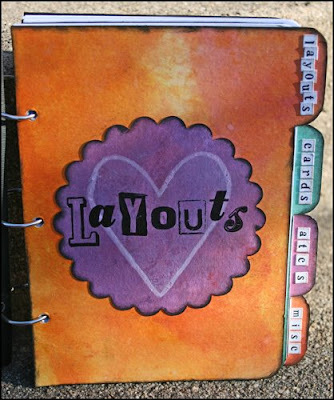 Carolee's Creations Tiny Letter Stickers were used to name each tab. The scalloped circles were stamped with a Heidi Swapp heart stamp using white ink, but they didn't show up very well, so I traced around them with white ink. The titles are made from Making memories rub on letters. The journal is about the size of a DVD, and just slightly thicker. A great size to carry in your bag, or leave on your bedside table for when ideas strike. 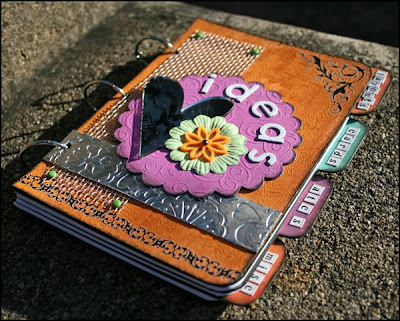 The pages are bound together using Kaisercraft split rings - which is great if I ever need to add or remove any pages. 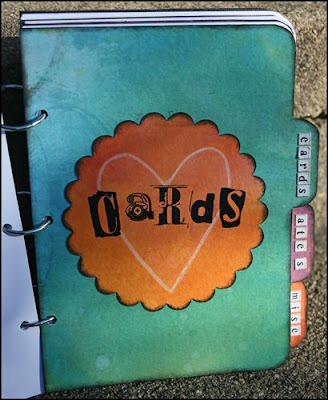 I love this Sarah - the colours are just perfect and I love all the texture too!